It’s raining, it’s pouring. Staying at home can actually be fun and exciting. And come to think of it, this will be an opportune time to catch up on the things you’ve long wanted to do and spend happy moments with the family. Remember, when it’s raining outside, staying “inside” is the best option. Yes, it’s time to be a stay-at-home chef! With a little help from the Internet and KING SUE products, you can whip up some treats for you and your family. Let’s your stormy weather story begin with a soothing and steamy hot Ham Tortilla Soup which the whole family can enjoy. Drain a can of black beans and stew some tomatoes and bell pepper, mix a cup of your store-bought salsa (mild, medium or hot, according to your spiciness preference). Let boil then add King Sue diced ham, grated cheese, favorite herbs and crushed tortilla chips. Curl up and watch your favorite TV series or finish that book you’ve been putting off reading. Make simple snacks like the Asparagus Roll-ups. Got that leftover crispy King Sue bacon from this morning? Flatten some leftover a slice of bread, then arrange some cheese slices, a stir-fried asparagus stalk, and the bacon. Roll, fry in butter and top of with grated parmesan cheese. 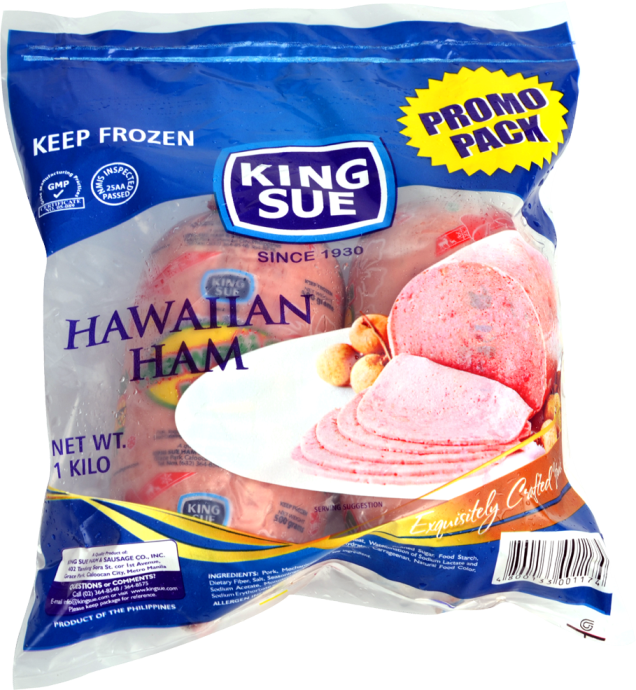 Cheer yourself up, feed your sugar craving with some pancakes with pancake mix and bits of King Sue Sliced Ham and Cold Cuts. Flip and toss in a skillet then arrange in a platter with maple syrup and fruit slices. The salty-sweet flavor combination will melt in your mouth, giving you enough feel-good feeling during the wet season. Thanks to King Sue! Call 881-0530 364-5430, 376-6441 and +639199889642 for inquiries and orders. Check out FB IG Twitter @kingsueham or email sales@kingsue.com. Also check out www.kingsue.com for more information about their meat products.